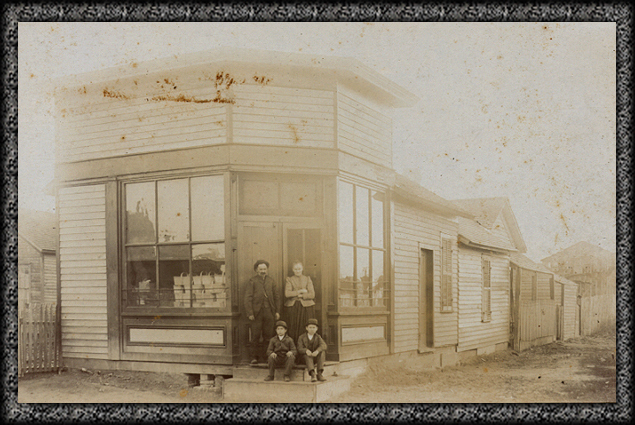 This is one of the 13 general stores that operated in Carbon Hill during its peak. Business was good even though the miners were expected to spend a certain amount of money in the company store in order to keep their jobs. The Big Four Coal Company was the towns largest employer, with about 800 employees. The smallest deep mine was operated by George Woods. The mine was sunk to 60 feet. He laid the tracks to the coal face, and was his own cageman, engineer, digger, driver, salesman and bookkeeper. Some of the other businesses were Montgomery's dry goods, a post office, an opera house, a barber shop, Ben Trotter's general store, Bill Kier's store, Isaac Bull's butcher shop, which butchered more meat than the larger cities of that time, and the McCarthy Hotel, which housed mostly Elgin, Joliet and Eastern railroad employees in 25 bedrooms. Store on corner of Lacey & Seventh operated by Jacob Jacklich. Pictured are Grandpa Domenic Baudino, his wife, and two boys: Tony and Joe. Domenic and Joe both worked in the mines for nine years. Tony worked in the mines for nine months.